The original Super Monkey Ball came out over a decade ago on the Nintendo GameCube, and since then the series has grown to become one of Sega’s key franchises. That is no mean feat, considering a lot of the other popular Sega franchises from the same time, such as Crazy Taxi, Jet Set Radio and Sega GT, were unable to keep up the same momentum and have fallen by the wayside. The appeal, it seems, is in the cutesy presentation and addictive puzzle gameplay that has helped the game gartner to a wider demographic, acting as sort of a forerunner to the casual gaming boom that is taking place now. Super Monkey Ball: Banana Splitz on the Vita is an all new adventure and not a port of an earlier game. The graphics in the Vita edition make use of the handheld’s high resolution screen and powerful processor to present detailed graphics that run at a good framerate. There is the option to play the game either with the analogue stick or motion controls, though after struggling with the accuracy of the motion controls in the iPhone version of Super Monkey Ball in the past, the added accuracy of the analogue controls in Banana Splitz was highly appreciated. The game also comes with numerous mini-games that make use of the Vita’s touch screen. The game concept, where one has to manoeuvre a monkey in a ball from one side of the level to the other, is simple and easy to get into, and no major changes seems to have been made by Sega to the gameplay from past iterations. That, however, also extends to the insane difficulty curve of the game. While the beginner and normal campaigns can be breezed through within minutes, the same can not be said of the advanced campaign and onwards. The player is given plenty of lives and continues to take on the difficult campaigns, but they may not be enough to tackle them. A lot of the levels require pin point precision and nerves of steel, so playing the game on the bus or train is likely out of the question. - A polished production that makes use of the features of the Vita while continuing the Super Monkey Ball tradition. - The game runs at a high resolution and smooth framerate, though the game world sometimes feels sparse. - Sound effects and voice samples seem to remain unchanged from past versions of the game, while the upbeat music is appropriate for the setting. - There are several single player campaigns and mini-games available, though the sharp difficulty spike in the more advanced levels will test the patience of players. - Being forced to restart a campaign from the beginning after getting game over is not fun. - The game comes with both motion and analogue controls, though the pinpoint precision required in levels will mean that analogue is the way to go. 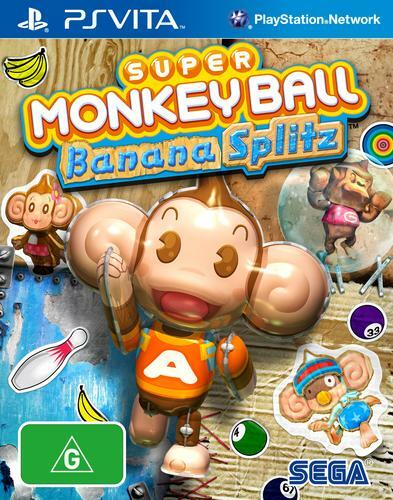 Super Monkey Ball: Banana Splitz brings the familiar puzzle gameplay to old fans and new, though players should be aware of the difficulty of the game before taking the plunge.